Open since Earth Day, 2009, the GBRC is located in the corner of the LEED certified gold Houston Permitting Center. See a demonstration vegetated roof that is irrigated with AC condensate. Browse the over 50 displays to familiarize yourself with green building technology and materials. 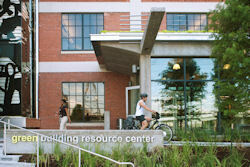 For more information, please visit www.codegreenhouston.org. Have your plans reviewed for opportunities to add green strategies to save energy, save water and make your buildings healthier. Hours: Monday-Friday 8 am - noon and 1 pm - 5 pm, and Second Saturdays of the month (except December), 10 am to 2 pm.